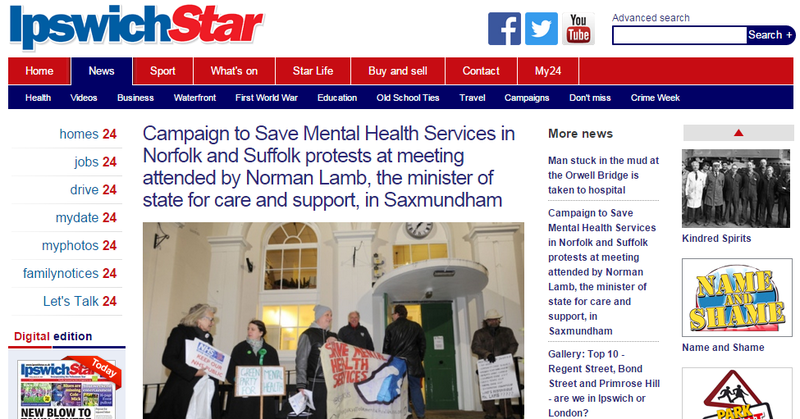 Norman Lamb, the minister of state for care and support, was met by a dozen members of the Campaign to Save Mental Health Services in Norfolk and Suffolk during his visit to Saxmundham on Thursday. The group was started by frontline staff and service users in response to the cuts at the Norfolk and Suffolk NHS Foundation Trust. It claims the service already suffers from disproportionate under-funding compared with physical health services and is being hit even harder by government cuts, leaving vulnerable patients less well supported. Group member, Steve Martin, joined after his brother David, who suffered from schizoaffective disorder, died alone in his flat in Ipswich from pneumonia last year, aged 52. Mr Martin said his brother was living in “squalor” with no heating or hot water after the removal of care visits. “What we really want to bring to the Government’s attention is the level of service that people are faced with is completely inadequate – and they are looking to cut more,” he added. Mr Lamb was last night unavailable for comment. ‘Mr Lamb was unavailable for comment’……..This cannot be true………..Oh wait a minute….The ‘Parity of Esteem’, and ‘I am a champion for Mental Health’ sound bites are old hat now…….time for a new one…hmmmmm. What about ‘I will actually DO something in the next six months to reverse this complete farce’…….don’t hold your breath anyone. He masquerades as the champion of mental health. Personally I have more faith in Champion the wonder horse (one for the oldies among us). He used to be an excellent constituency M.P. The promotion has not helped him or us.